Virgin cork with metal hook provides the perfect surface for mounting your orchid. It is lightweight, rot resistant, non-toxic and soft. Orchids love the texture and the roots quickly wander thru the rough surface. 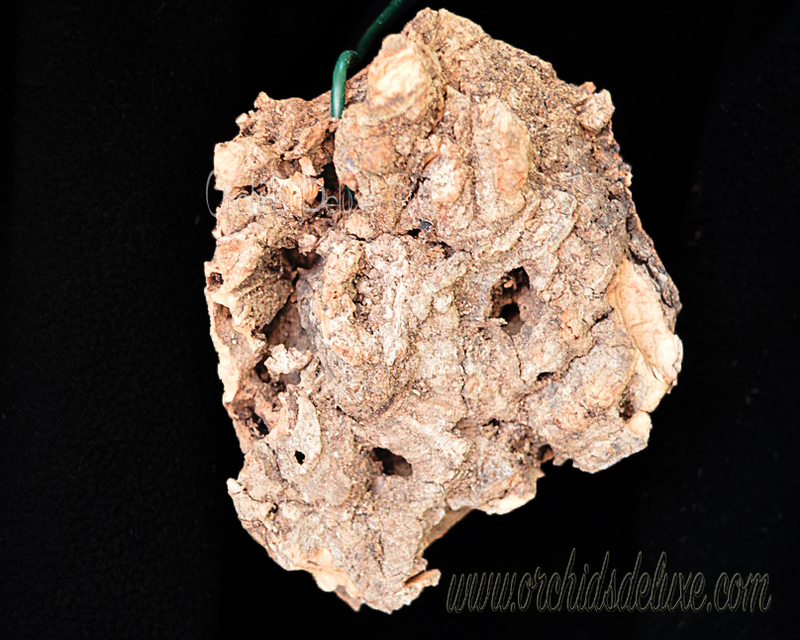 Virgin cork bark is a great medium for mounting orchids or any epiphytic plant that needs a lot of air or very dry periods. It is a natural product, each piece is unique, has its own texture, shape and thickness. Due ti that the dimensions may differ slightly. How to use cork slabs. Place the orchid against the cork and lightly cover with moss on the outside, firmly tying the plant with fishing line or strips of nylon stocking. Better to place moss on the outside of the roots, not between the roots and the cork. This helps to keep the roots moist and let them adhere to the cork surface. Once the plants are firmly rooted, you can remove the wire. Please let us know if you are looking for certain requirements. We can provide any individual sizes.